MONTREAL, Quebec — April 8, 2019 — At NAB 2019 (booth SL3811), Matrox® will showcase its full range of award-winning HD and 4K/multi-HD encoders, cutting-edge SMTPE ST 2110 NIC and hardware codec cards, and high-performance 4K IP KVM extenders. Debuting at this year’s show is the powerful Matrox Monarch EDGE 4K/multi-HD, low-latency encoder, which will drive both 4K and quad-HD webcasting and remote integration (REMI) workflows. The popular, easy-to-use Matrox Monarch LCS and Matrox Monarch HDX streaming and recording appliances meanwhile, will highlight simple yet robust lecture capture and social media broadcasting, respectively. OEMs will also have the opportunity to learn about the newest developer products featuring unprecedented multi-channel support, including the high-density Matrox DSX LE5 SMPTE ST 2110 25 GbE NIC cards for COTS IP solutions, and the Matrox M264 S4 card—the world’s only four-channel 4Kp60 Sony® XAVC solution to enable multi-channel 4K workflows in PC-based video production servers and 4K instant replay systems. In addition, the Matrox Extio 3 IP KVM extenders will provide seamless extension, switching, and control of multiple post-production systems from a distance, at a mere 5% of the network bandwidth required by the next closest bandwidth-efficient IP KVM extender. The IP Showcase also returns to NAB for another year, where Matrox again will be a participant and leading contributor to the advancement of standards-based IP infrastructures. In the IP Showcase Future Zone (booth C12634), the game-changing Matrox X.mio5 Q25 NIC card will be part of a must-see SMPTE ST 2110 educational demonstration, exhibiting real-world implementations of real-time, IP-based professional media applications. Featuring next-generation 3G/12G-SDI and 25 GbE SMPTE ST 2110 connectivity, as well as versatile multi-protocol support—including RTMP, SRT, MPEG2. TS, and RTSP—the robust Matrox Monarch EDGE 4K/multi-HD encoder will showcase how to take advantage of today’s evolving webcasting innovations. Broadcasters will discover how Monarch EDGE delivers 4K streams at high frame rates of 50 or 60 fps to ensure optimal viewing experiences on any size device. Attendees will also learn how Monarch EDGE can harness the capabilities of online video platforms (OVPs) with multi-camera support like YouTube, which uses the encoder to capture and stream up to four cameras, and allows the viewer to select and/or switch to their preferred camera view. Matrox Monarch EDGE will also illustrate how to affordably produce multi-angle live events by extending the production studio to any remote location with a standard network connection. 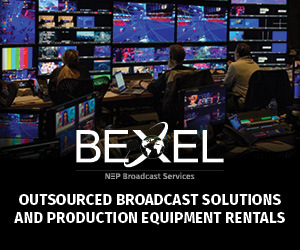 Via a live, multi-camera sporting demonstration, the compact, robust, low-power appliance will synchronize and securely deliver remote camera feeds—with remarkably low latency—to either a production system on a standard LAN or a cloud-based destination. Programs destined for web or over-the-top (OTT) delivery can select the 4:2:0 8-bit Monarch EDGE encoder version, while the 4:2:2 10-bit-capable encoder option is ideal for demanding, broadcast-quality productions. The Matrox Monarch LCS multi-source streaming and recording appliance will exhibit how IT administrators can readily integrate these encoders into today’s most popular open video and learning management systems, and how operators can in turn, easily define profiles for live streamed and recorded lectures by mixing camera and presentation material. The Matrox Monarch HDX dual-channel broadcast streaming and recording appliance meanwhile, will reveal live webcasting made simple by streaming from HDMI or SDI sources to Facebook Live, YouTube, and other OVPs—with multi-camera production value—while simultaneously recording to a second location. Matrox DSX LE5 Q25 and Matrox DSX LE5 D25 SMPTE ST 2110 25 GbE NIC cards simplify the transition from multi-channel SDI workflows to multi-channel IP workflows by delivering up to four 4K or up to two 4K IP video I/Os, respectively, over 25 GbE networks. Broadcast OEMs can now choose from a variety of SMPTE ST 2110 card options to design the world’s most advanced IP-based, multi-channel 4K broadcast media systems. The Matrox X.mio5 Q25 NIC card features multi-channel IP video I/O from HD to 4K—with zero CPU usage—on-board multi-channel HDR conversions, along with motion adaptive de-interlacing, pristine scaling, and powerful compositing engines for high-density 4K video processing. Architected as a video-aware COTS SMPTE ST 2110 NIC card, Matrox X.mio5 Q25 delivers 24/7 reliability and interoperability required of broadcast equipment, while offering the flexibility and scalability expected of IP infrastructures including standard network stack functionality. The Matrox M264 S4 card supports up to four channels of 4K Sony® XAVC and Panasonic® AVC-ULTRA encoding/decoding in a single-slot card to enable high-density, multi-channel 4K workflows in PC-based platforms. The new codec card can also encode/decode up to 40 streams of HD XAVC Class 100 or XAVC Long 25/50 at 4:2:2 10-bit, or 64 streams of HD at 4:2:0 8-bit, with ultra-low power consumption, in the smallest footprint. Matrox X.mio5 12G and Matrox DSX LE5 12G cards provide multi-channel 12G/3G SDI I/O for 4K workflows, featuring four 12G inputs, four 12G outputs, and four 3G reconfigurable I/O, or 12 completely reconfigurable 3G I/Os. The Matrox X.mio5 12G card also boasts on-board multi-channel HDR conversions along with motion adaptive de-interlacing, pristine scaling, and powerful compositing engines, making it the complete solution for 4K HDR workflows. Matrox Extio 3 IP KVM extenders will deliver exceptional 4Kp60 4:4:4, dual 4Kp30 4:4:4, and 2Kp60 4:4:4 performance over a standard 1 GbE network at unprecedentedly low bitrates. Extio 3 cards and appliances work with COTS network switches, illustrating a scalable and cost-effective KVM matrix over IP to securely route any system to any remote location on the network.